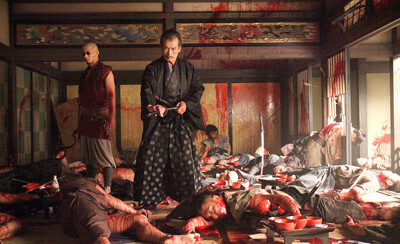 The time of being surprised that horror mastermind Takashi Miike can direct solid samurai films has come to an end. With remakes of 13 Assassins and Hara-Kiri under his belt, he's turned into a reliable source of contemporary takes on historical samurai action, when he's not off tackling some other genre. Something those prior efforts share in common is that they're remakes of stories that have already appeared on the big screen, both from the �60s and both which operate within they space of hardbound realism. They offer Miike visual references through which he can adopt what worked in the originals and tweak other elements to better suit his sensibilities, often punctuating the violent aspects of those tales with his signature boundary-pushing grotesqueries. Blade of the Immortal is of a different breed, an original adaptation of a Japanese manga that also relies on supernatural elements to keep the hero moving forward through the bloodshed, and Miike's craftsmanship and visceral bravado struggle to land their blows alongside the lack of suspense involved with the protagonist's mystical plot armor. The reason behind Rin's pursuit for assistance from Manji also becomes an obstacle that Blade of the Immortal must constantly work to overcome: how to elevate the stakes of an immortal, self-healing samurai's charge toward murderous vengeance against mortal enemies. It's a problem frequently taken on by stories involving Wolverine in the X-Men franchise, but the magical boundlessness of Manji's curse, or blessing, or whatever it's considered, further simplifies the concept and reinforces the situation's inevitability. In the books, Manji has an endgame presented to him, in which he'll regain his mortality as soon as he's killed a thousand evildoers � and the members of the Itto-ryu fall into that category. Those rules aren't emphasized in Takashi Miike's adaptation, though, instead relying on Rin's physical similarities to Manji's deceased sister as a means of driving him into battle after battle, which isn't enough to add depth to the scenario where he cuts through enemies -- and they futilely cut through him -- with predictable results. His enchantment guarantees survival, which dulls every victory. Predictably, Takashi Miike delivers brutal, almost cartoonishly gory square-offs, where the less-realistic atmosphere of Blade of the Immortal affords him the opportunity to go a little wild with the slicing and dicing. Hands and arms fly off, bodies are split in half, and some gnarly impalements happen, but the generous period-film production design and the cinematography from Nobuyasu Kita -- who also shot director Miike's other samurai films -- lend unpretentious, yet alluring artistry to the consequences of combat. 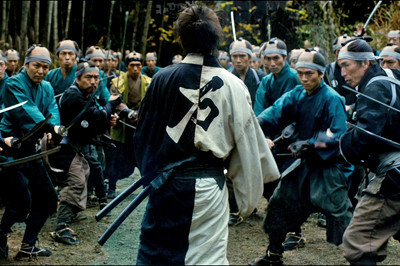 The choreography does often center on dodges, parries, and strategic swipes involved with swordplay, but the primary concern of these sequences can be found in how Takuya Kimura's dedicated portrayal of Manji sacrifices his permeable body while engaging threats that would otherwise result in his demise, integrating his ability to take blows so he can land others into his evaluations of his opponents' techniques and surroundings. Elegance isn't a factor, as these are rough-�n-tumble fights with an assortment of nasty weapons at Manji's disposal, beautifully shot and edited in their messiness. Stock press-kit footage and interviews accompany the Blu-ray release of Blade of the Immortal, led by Man vs. 300 (18:24, 16x9 HD), which gathers together almost twenty minutes of behind-the-scenes material that offers a glimpse at Takashi Miike's orchestration of a larger-budget samurai film. A few off-camera interview spurts break up the footage, but it's mostly just a raw glimpse at the components that went into crafting the huge brawl at the very end of the film. A long, yet basic series of Cast Interviews (56:10, 16x9 HD) focuses on Hanu Sugisaki (Rin), Kagehisa Anotsu (leader of the Itto-ryu), Hayato Ichihari (Shira), Erika Toda (purple-dress assassin), and several others, while one lengthy stretches dedicated directly to an Interview with Takuya Kimura (28:44, 16x9 HD) � with a guest appearance from Takashi Miike and additional focus on production elements later in the discussion. Magnolia/Magnet have also included a Poster Gallery and a pair of Trailers. The fantasy-laced premise of Blade of the Immortal may immediately set it apart from Takashi Miike's other historical samurai epics, but the visual language and intensity made it look like the director could be crafting something just as dramatically rich and � plausible, within reason, as those. Indeed, it seems as if the director might want for his tale of an immortal, self-healing swordsman to be taken more seriously than not, as the attitude often revolves around a grim and grueling attitude involving a young girl's desired vengeance for the slaughter of her family, who were killed by a near-mythical band of warriors every bit the match for the hero. The execution leans in another direction, though, as Takashi Miike's often excessive violence takes hold in admittedly rather engaging duels, while the questionable and shifting logistics of Manji's supernatural powers gradually bleed the earnestness of the concept out. It's entertaining enough to mildly Recommend the package, especially Magnet's Blu-ray, but it's certainly lacking the sharpness of Miike's prior samurai outings.